The first full weekend of December each year brings us the filming for the annual Disney Parks Christmas Day Parade on ABC. We were there for the second day, and have some photos and video to share. Morning of day two for the Disney Parks Christmas Day Parade filming. 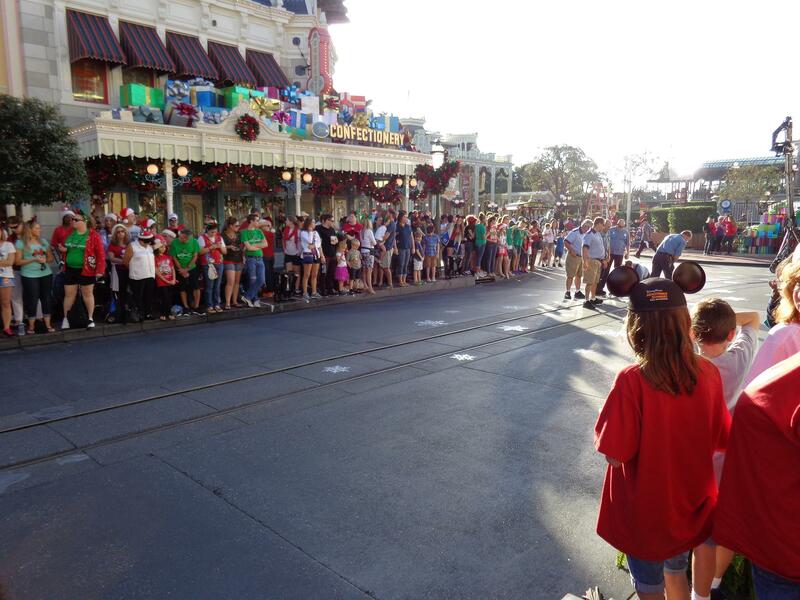 The audience has lined up on Main Street U.S.A. for the filming of the opening performance and parade. First up for the day was filming the big opening musical number with this year’s host Neil Patrick Harris. 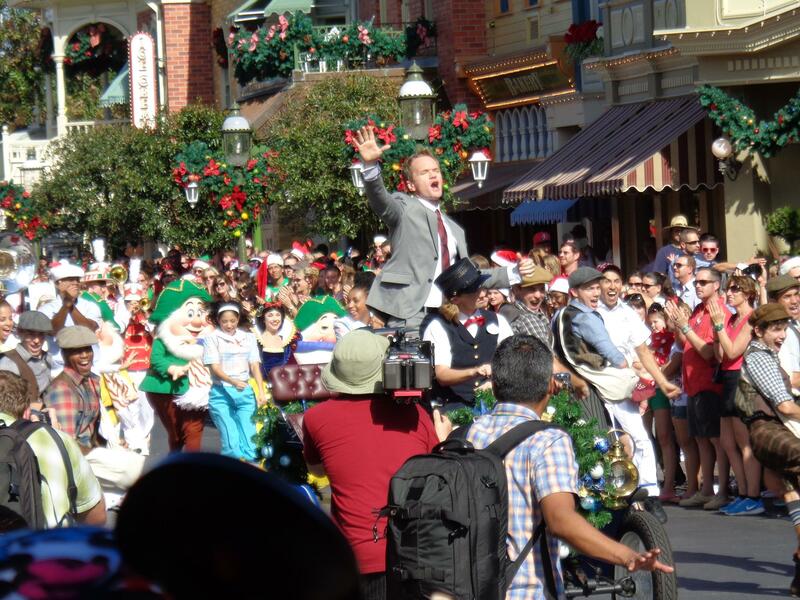 The performance involved many Disney characters, dancers, and entertainers filling up all of Main Street. 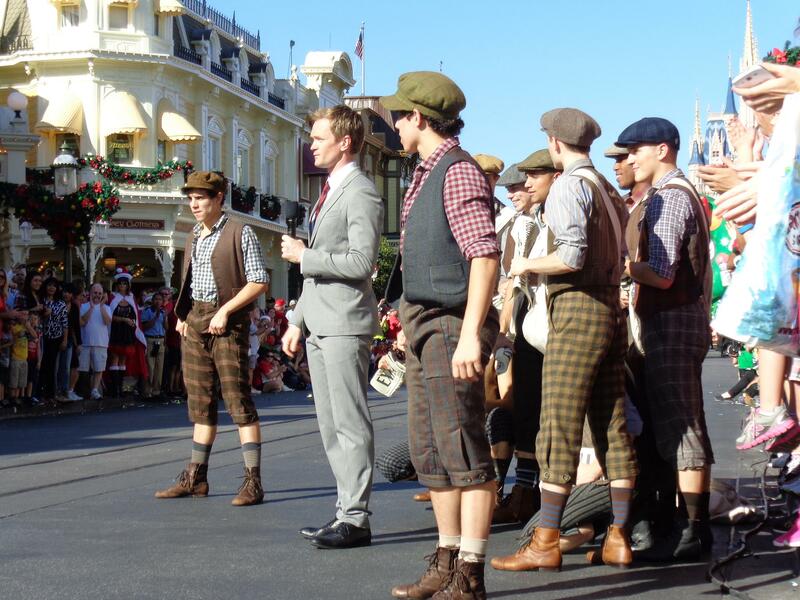 Even some of the Broadway cast of Newsies were there. 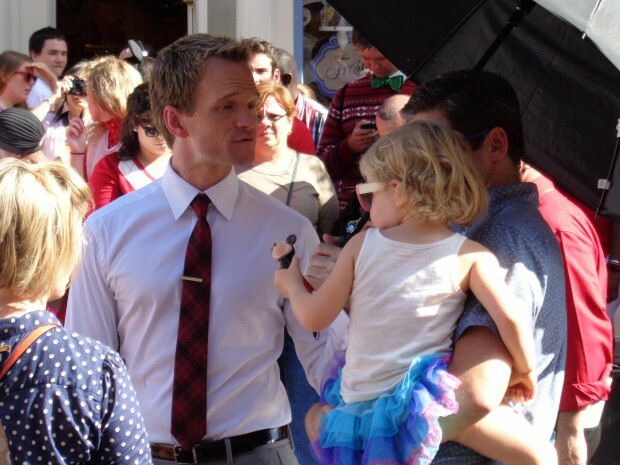 Neil’s husband and daughter were there to give him support. 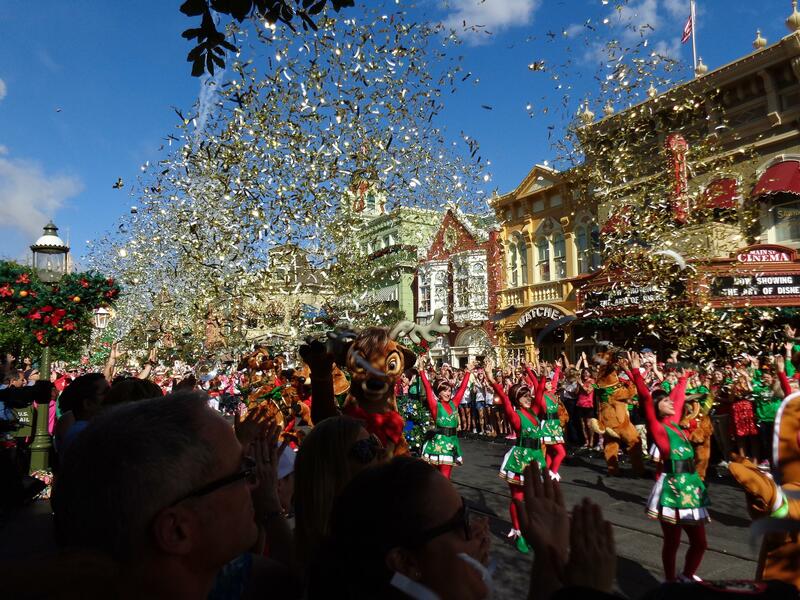 The finale of the opening musical number involved lots of confetti and fireworks down Main Street. After the confetti went off, the Magic Kingdom custodial team “swept” into action to clean up as much confetti off the street as possible. 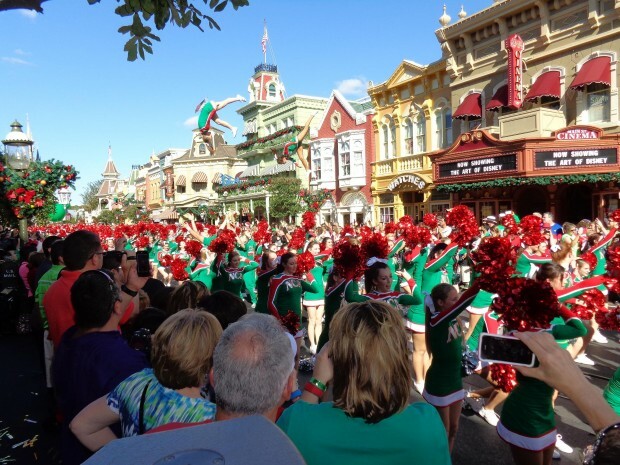 It’s a tradition for many recent years to have a performance from the National Cheerleaders Association and National Dance Alliance teams. 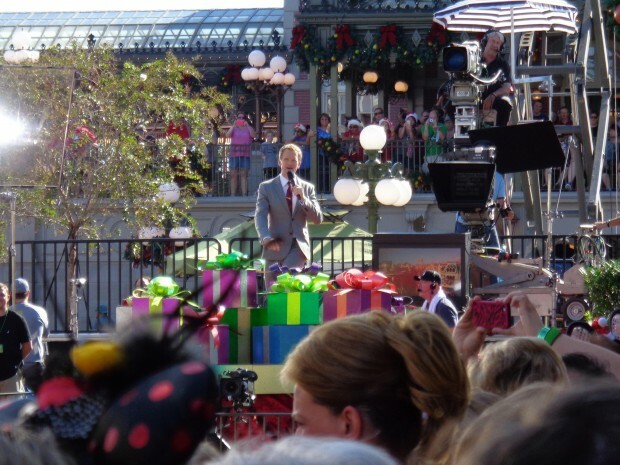 For most of the parade portion, Neil Patrick Harris stood on the host platform overlooking Main Street from Town Square. 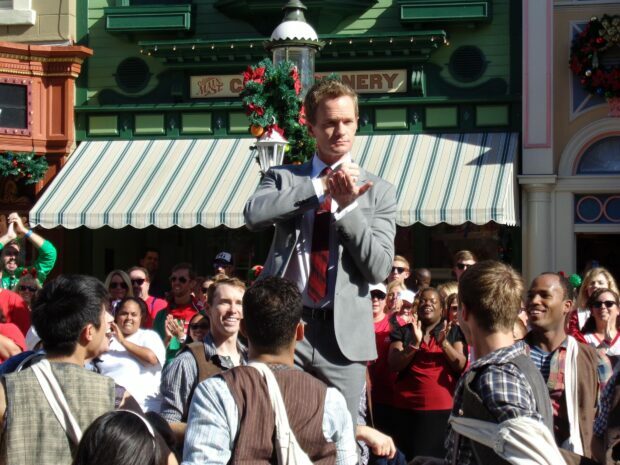 For some shots, Neil went to the streets with the audience. Here he talks about the cast of Newsies. 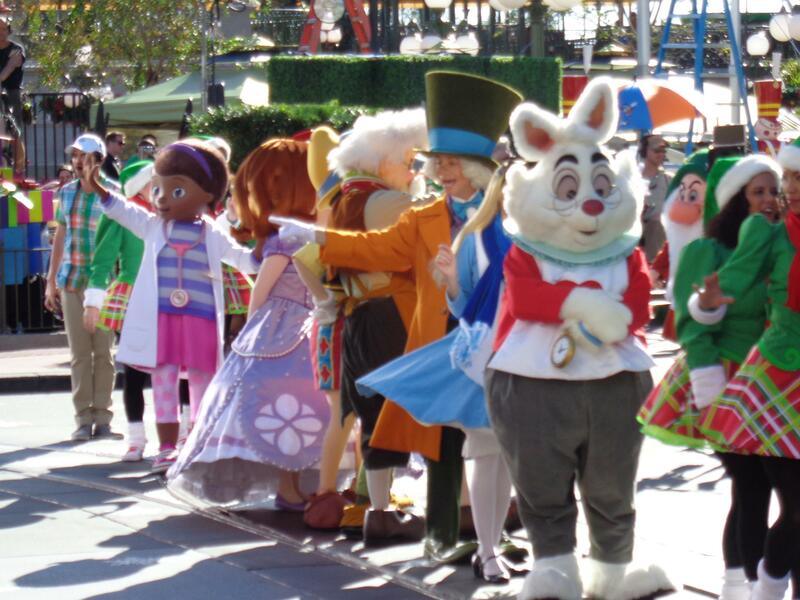 Lots of characters came out for some opening tease shots, including Doc McStuffins, who made her Disney Parks Christmas Day Parade debut. 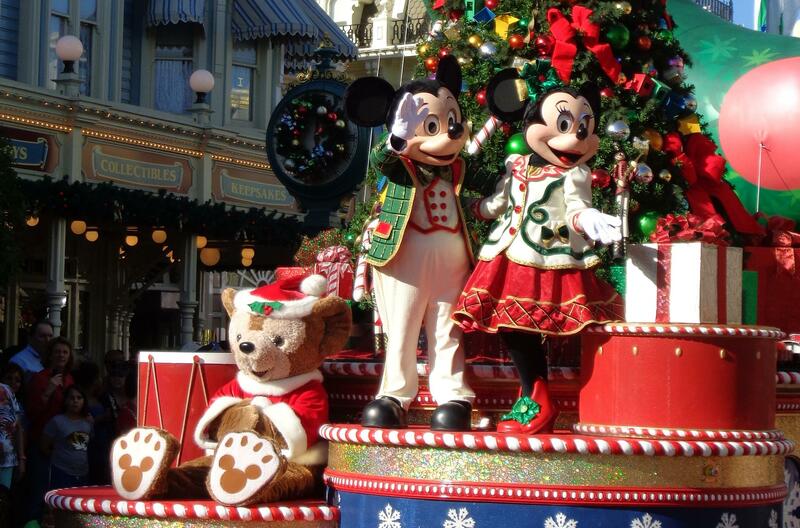 Mickey, Minnie, and Duffy kicked off the parade portion of the filming. 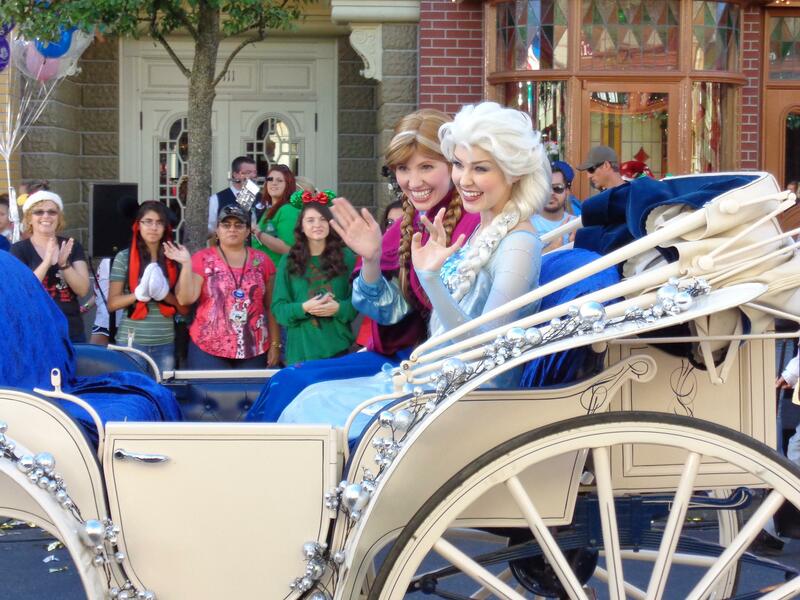 Anna and Elsa from the new film “Frozen” made their Disney Parks Christmas Day Parade debut. 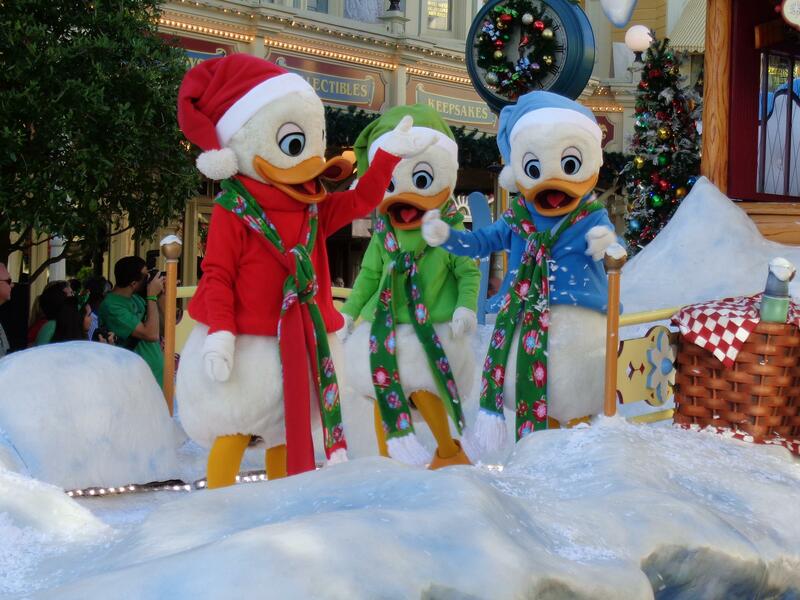 Donald Duck’s nephews Huey, Dewey & Louie made a rare appearance for the parade filming. A tradition every year is to include the marching toy soldiers. With Santa Claus appearing in Disneyland for the parade this year, Darth Vader and his Stormtroopers helped fill the void. 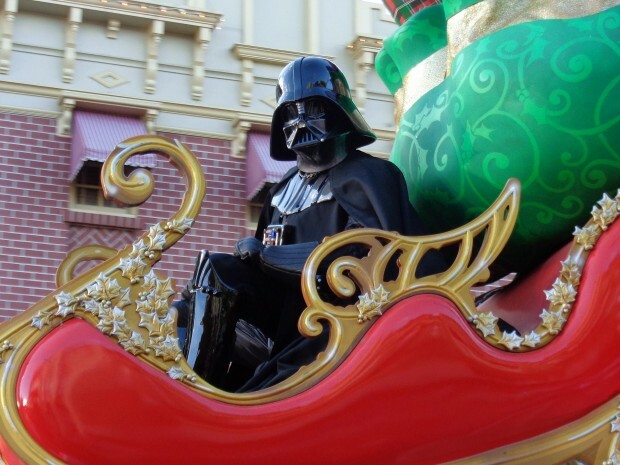 It was quite a funny sight seeing Darth Vader in Santa’s sleigh. Neil reacting to Vader as Santa’s replacement. Just wondering if they are done filming? The crowds were terrible yesterday and we could not enjoy Main Street, also there was no tree in the town square. We were stuck on the train for 40 minutes at one point too for filming – it was a disappointing day at the MK! Hopefully today will be better! Thanks for your reporting! Filming is done. 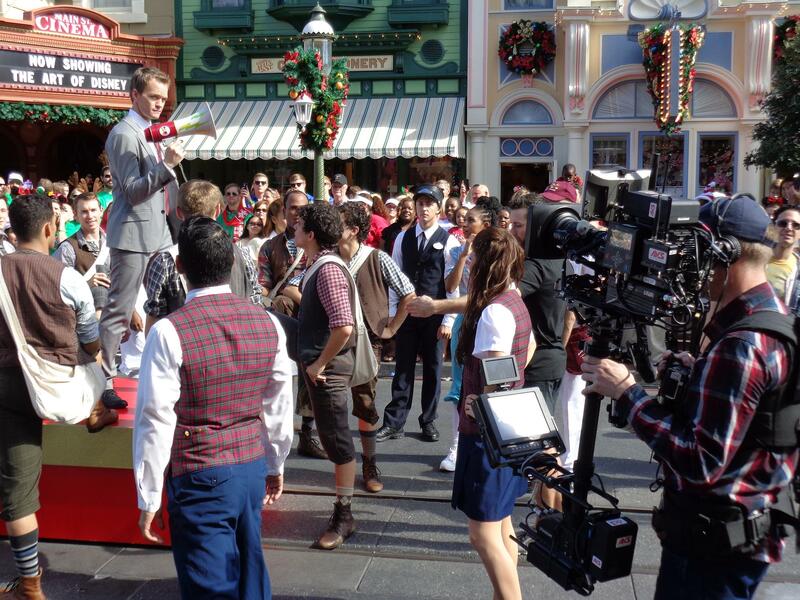 They only film for two days at the Magic Kingdom. Hope today was better for you! 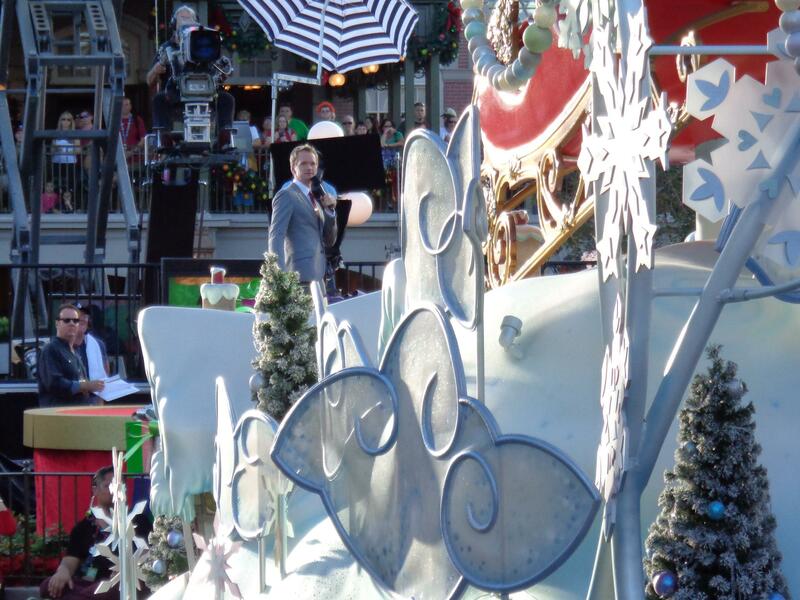 I was there on Saturday and saw the filming. It was fun. What is the name of the song that they are singing in the opening number of the first video? 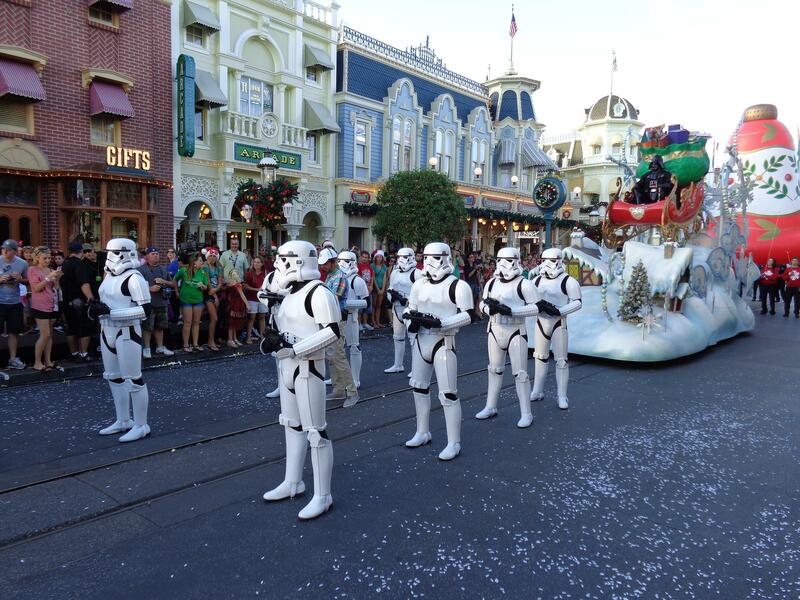 We were there this past weekend and at Hollywood Studios on Sunday. 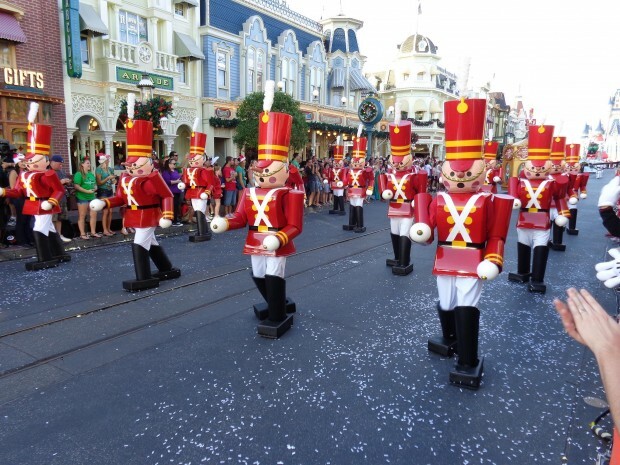 A crew appeared out of no where in front of the big hat / stage as we were hanging out eating an ice-cream. They then rolled out a red carpet, grabbed a couple kids (my daughter included) and taught them a quick dance. Pluto, chip and dale appeared, and Mariah Carey Christmas music came out of no where. Someone was “filming” (she had a camera) and people were told to keep out of the shot. Was this for real? 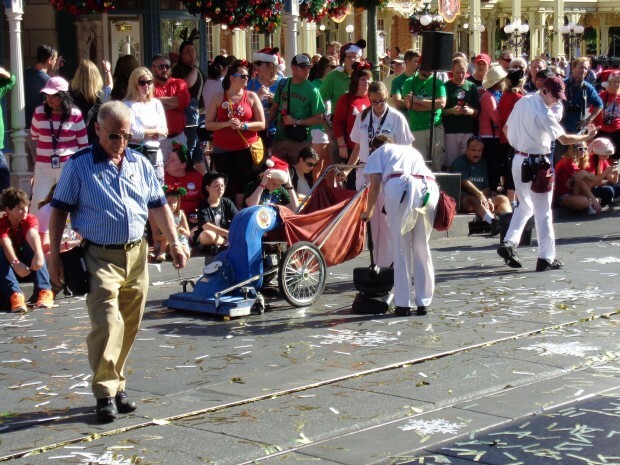 Would it possibly be part of the taping of the parade? I recall in past years watching the parade they showed Hollywood Studios….thanks!